Jill DeWit: And I’m Jill DeWit, broadcasting from sunny Southern California. Steven Butala: Today, Jill and I talk about what to do if you’re data afraid. Steven Butala: What’s your definition of being afraid of data? Steven Butala: That’s too much to take. Jill DeWit: I don’t know what to do with this. And we can help you. Steven Butala: There’s stuff that I had that reaction to still. Jill DeWit: Yeah. Like girls. Jill DeWit: For some people, it’s opening the hood of a car. Jill DeWit: –like opening the hood of a car. Jill DeWit: So, thank you. Steven Butala: Well said, Jill. Steven Butala: Before we get into it, let’s take a question posted by one of the members, one of our members, on the Landinvestors.com online community. It’s free and I have to preface this. Steven Butala: This is a long question. Jill DeWit: Thank you for telling me. Steven Butala: And may I read the first part and then have you read the second part? Steven Butala: Michael says, or asks, “I have a deal consisting of seventy-five acres within the city limits, adjoining developments on three sides. And what I will sell–and what I will sell as the next piece of land in the path of Progress Prime for Development. 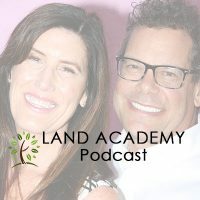 When sending over the contract, the seller’s nephew is an out-of-state real estate agent, in true real estate agent form, was ready to jump in head-first and fill the contract out with [inaudible 00:02:06] and contingencies and terms.” Go ahead, Jill. Jill DeWit: “Question, he wants to convey the property via quitclaim deed. When I asked why, he said it is typical that a seller will convey via quitclaim deed because this limits the seller’s liability. He also mentioned that I will get a marketable and insurable title. While it’s obvious the seller’s liability is minimized, can a quitclaim deed be conveyed with a title policy? I will not spend $80,000 on a property without getting the title examined, ensuring that I will have clear and marketable title. Is it common for a seller of land to minimize his liability through a quitclaim deed and possible for the buyer to purchase title insurance post transaction knowing the title is insurable via title examination pre-transaction? You’ve had time to think about this a little bit, haven’t you? Because you read it. Steven Butala: This is a massive red flag for me, and I wouldn’t do the deal. We’re not talking out of both sides of our mouths, you’ve heard us say many, many times, “Don’t worry about quitclaim deed,” and that’s true for 4,000, 2,000, 1,000 dollar property. This property is clearly going to be developed and nobody will lend against it, no one. Whoever buys this from you is going to seek out some type of financing to develop it. At least you hope so because you can mark it up. Steven Butala: It needs title insurance, and it needs to go through escrow and it needs to go through the absolute triple A proper channels and fact for developable piece of property. If this is in fact what this is, I would seek out a commercial real estate, a commercial title company. First American or any of the large companies have commercial divisions, that’s what this is for, cause they look for different stuff. This is not to be messed around with. Jill DeWit: Why are they ramming it down your throat? Steven Butala: A quitclaim deed generally has to do with one of two things: interrelated party transactions, like I sell a property or deed a property to Jill. Or, it has to do with property that was purchased in a tax auction or something like that, maybe two owners ago. And look, this deal is real. All the deals are real, this deal has the potential. I mean, seventy-five acres is a big piece of property in an urban area. I would do nothing but go through title and everything else. And I’m guessing that the nephew is brand new and he’s fresh out of silly, little real estate school and he’s getting all academic about the different ways to title property. Steven Butala: What should happen is this: sellers agreed on this $80,000 price, you’re the buyer, theoretically have the eighty grand. There’s no debt. You’re not going to get a lender. You go straight to escrow, put $5,000 down as earnest money deposit, and the escrow agent takes it from there. And nobody talks about the type of deed that’s going to be conveyed. Steven Butala: What comes out of the title plans–that’ll show how to convey the property, and trust me, it’s going to be a warranty deed. Or whatever state it’s in, that version of a warranty deed. You don’t take anything less for a development piece of property. Steven Butala: Can I be more clear? Steven Butala: Do I sound like I’m a little bit angry? Steven Butala: I am a little angry. Steven Butala: Cause this is silly, little real estate agent crap. Steven Butala: Today’s topic: what do you do if you’re data afraid? This is the meat of the show. Jill DeWit: You want to hear my steps? Steven Butala: I do. I would love to hear. I know you wrote a bunch of stuff down. Jill DeWit: All right, so what do you do if your data afraid? Steven Butala: It looks like throw up to you? Jill DeWit: It looks like throw up to you. Steven Butala: It looks like dirty diapers. Number one: Breathe. That’s really not number one, but what I want you to do first is take time, insert a column of–I’m going to get real technical here and make this real easy for everybody. Steven Butala: Well, it’s a good break for me. Jill DeWit: Okay, good. You just can just rest–rest your pretty little head over here. Jill DeWit: Here, rest your pretty little head right here. Steven Butala: That’s right and it clanks headphones. Steven Butala: Rural Undeveloped Four Thousand Feet. Steven Butala: You have to have a four thousand square foot lot to put up a structure. Steven Butala: There’s duplicate data? Steven Butala: She’s saying make the data manageable for how you need it. Jill DeWit: Yes. Exactly. So all you do is pay attention to that and be ready to move those columns, hide those columns, maybe even delete those columns. What I always do, too, by the way. When you download this spreadsheet of all this data–this is like 101, you have to learn this stuff–save that untouched. Steven Butala: Version one, version two, version three. Jill DeWit: Exactly. Now start messing with it. Steven Butala: In case you screw stuff up you can go back to the previous version. Make it easy on yourself. Like one of the columns that–say you download for a bunch of land and it pulls up some attribute like swimming pool. You don’t need that, delete that column. Square footage of the property? They’re all blank? Delete that column. You’ll see that. Jill DeWit: Just to understand data. Steven Butala: What if the whole show is about–what if this just freaks you out? Jill DeWit: Okay, let me back up. Don’t even think about the mail merge. This totally freaks you out. Well, one: look at your columns. Two: delete the duplicates, so you’re not looking at extra data you don’t need. Three: practice, practice, practice, practice, practice. And you really have to do that, and do it in chunks–maybe look at a hundred a time. Jill DeWit: Well, okay, can I throw my whole list in here? Steven Butala: Go ahead, yeah. Steven Butala: I’d actually lead with that. Jill DeWit: Okay. If all else fails, like I kind of alluded to at the beginning of the show, you open up the car hood and you’re like, “Oh, there’s no way.” And you went to mechanic school and you still open the hood going, “Oh, there’s no way.” You know what? Steven Butala: Call a mechanic. Jill DeWit: I’m clearly not going to do my own oil changes, ever. I’m going to close the hood, I’m driving to Jiffy Lube. Jill DeWit: You like to go look at them. Steven Butala: I do because I’m enamored with people that can play the guitar and musical instruments and stuff. It’s just never going to happen for me. Steven Butala: And it’s not in my wheelhouse, so if this is your guitar, just move on to something else. Why beat yourself up over it? Steven Butala: Or find another way. Do [inaudible 00:13:26] or something. It won’t be as effective, and it’s not as technical, but maybe you can make it work. I don’t know. A lot of people do. Steven Butala: We just don’t choose to do it that way, so my step one is take a couple of steps back and ask yourself if it’s truly worth it. What is this all about for you? If the answer is, “I’m still afraid of data, but I do see how this can be ridiculously valuable,” then you’re going to have to get–I’m the type of person that, when I went to school, I had to study twice as hard as everybody to get the same grades. And I wanted to do that. I wanted to get out of college and go do something, so I made it a priority, made the time, got organized, and got out a calendar as crazy as it sounds, and just stuck to it. Jill DeWit: Put the time in. Steven Butala: Which is still what I do. Yeah, time management. So don’t get so afraid–you have to decide if it’s lost cause. If it’s not, then get organized, because you can organize yourself out of just about anything. And I hate to say this cliché, but I’m going to say it: How do you eat an elephant? One bite at a time. And so, she’s right. That’s what Jill is getting at. Take it column by column by column and use–please, I’m begging you–use YouTube. There are tremendous resources on YouTube about mail merges and how to use a spreadsheet and how to move stuff around and get really, really proficient at seeing the data differently. Just take off little baby steps and take little bites all the way through. Jill DeWit: Tell you where I see people failing the most. Jill DeWit: And it’s not that they’re afraid of it or anything, they just want to rush through it and get to the end. Steven Butala: It’s a lack of organization and lack of planning. I totally agree. Jill DeWit: I see people that go, “Oh, this just takes too much time. It’s just not going to work.” No, you’ve got to put the time in. Jill DeWit: And once you get it–think about it–think of the example I just described. You download this huge dataset. And you’re tearing up because it’s just overwhelming, right? But after ten, you’re like, “I got this. Yes, no, no, yes. Move this here. Now I’m ready to do my thing.” That’s it. It’s like everything. Think about getting behind the wheel of a car. Do you remember? Like, my current car right now, which I still don’t understand what it all does, but let me tell you how funny this is. Or even flying a plane is another one, but my current car–when I first drove my car from the dealership, I only drove it forward. I never had to back up, so–this is funny. Steven Butala: It’s a spaceship car you have. Steven Butala: I can’t say I condone this type of thing at all. Like, every car on the planet is very clear which gear you’re in and for whatever reason the manufacturer of this car decided they were going to change the rule on that. Jill DeWit: Anyway, I love my car, but the point is: In the beginning of it, I didn’t know how to back up my car. Now I do, I just get in and voop! I know what I’m doing. I got this, it’s easy. Steven Butala: So, now you’ve decided that data is worth it for you? Steven Butala: And maybe you’ve even gotten to the point–or you’ve got a partner like Jill said, like Jill did and said–and now you’re chugging along and you decided you don’t like it. That’s the kicker for me. Jill DeWit: Oh, can I answer this one? Steven Butala: Because some stuff, it’s just not worth it. Go ahead. Steven Butala: There’s a million ways that Jill and I can make a lot of money together and we actively pick and choose the ones that we want to be involved in. Like teaching. This is not the most profitable thing Jill and I can do together. Not even close but we both like it. Go ahead. Jill DeWit: And that might happen. Steven Butala: I have a really good friend who’s very good at buying, renovating, and selling manufacturing companies, and it’s crazy profitable. Crazy. I don’t want any part of that. Steven Butala: It involves financing and hiring and letting people go and reorganizing and the EPA. And he gets rewarded for that times ninety financially, but I don’t want to spend one week on stuff like that. Well, you’ve done it again. 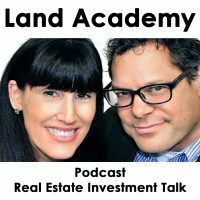 You’ve spent another twenty minutes or so this time listening to the Land Academy Show. Join us next time, where we cover another interesting acquisition topic. 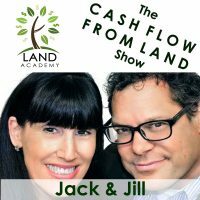 Jill DeWit: And we answer your questions posted on our online community at landinvestors.com. It’s free. Jill DeWit: Did I do a good job explaining how to breathe through that? Steven Butala: Both of us. Steven Butala: It’s not scary for you because you broke it all down. You broke it all down for the show. Jill DeWit: That’s how I think. Steven Butala: That’s how I think too. Jill DeWit: There you go. Well, you’re pretty smart. Steven Butala: What scares you? What freaks you out? Jill DeWit: You. Just kidding. Kids, no. What freaks me out? I can’t think of one. Unknown, natural disaster. I can’t think of anything. What freaks you out? Steven Butala: I don’t know. There’s a reason we have this show about data because that’s far from it. You know a schematic–like an engineering schematic of a doorknob–and it’s all different layers and how it all goes together? That’s how I see everything. So that kind of stuff doesn’t freak me out when there’s fifty-two steps to get to some end, I’m good with that. The thing that freaks me out the most is a variable and people’s responses–just people–and dealing with people. It doesn’t freak me out, I just don’t like to do it. Steven Butala: So that’s why I have you, I guess. Jill DeWit: That’s true. Share the fun by subscribing at iTunes and YouTube. While you’re at it, please rate us there. Steven Butala: To buy under-valued property.